This great 73 hectare vineyard has been producing top class Pauillac since the late 1980's when Jean-Michel Cazes of Lynch Bages took control and re-vitalised the property. In recent years, under the ownership of AXA insurance, Englishman Christian Seely has been in charge and quality continues to rise. The vineyard is planted with 62% Cabernet Sauvignon, 32% Merlot, 4% Cabernet Franc and 2% Petit Verdot. The grand vin is now made only from fruit produced in the original vineyard that is opposite Latour and next to Lascases. Latour-like in style, Pichon Baron has been a star performer in our recent blind vintage tastings. Two second labels are now produced - Les Griffons (from the younger vines) and Les Tourelles de Longueville (from a specific parcel of mostly Merlot vines). The concentration and largesse of the 2016 Pichon Baron is apparent from the get-go with incredibly alluring, ripe and expansive fruit aromas in the blackberry, dark-cherry, mulberry and plum zone. Espresso and cedar, as well as a slate-like, stony mineral edge add complexity. The palate has incredible depth, drive and detail. Fine and plush tannins stretch the palate in every direction. So fresh and vivacious, this is the greatest Pichon Baron since 1989 and has a long future. Try from 2024. The 2016 Château Pichon-Longueville Baron is beauty and is a blend of 85% Cabernet Sauvignon and 15% Merlot that was brought up in 80% new French oak. Tasting like a hypothetical mix of the 2009 and 2010, its deep purple color is followed by a powerful yet sensationally pure bouquet of crème de cassis, blackberries, lead pencil shavings, and graphite, and is just about as quintessentially Pauillac as it gets. Full-bodied, fleshy and even a touch flamboyant, it has sweet tannins and a monster texture that coats the palate. Count me in as a huge fan. This fabulous wine will be relatively approachable in just 3-5 years but will age for 30 years or more. Drink 2022-2052. 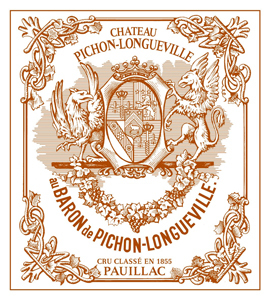 Deep garnet-purple colored, the 2016 Pichon-Longueville Baron offers a suave and seductive nose of warm red and black currants, black plum preserves, truffles, tapenade and rose hip tea with touches of sandalwood and Chinese five spice plus a waft of iron ore. Medium to full-bodied, firmly structured and packed with mineral and exotic spice-laced black fruits, it finishes very long with compelling herbal sparks. Drink 2022-2057. The 2016 Pichon-Longueville Baron electrifies the olfactory sense with a stunning bouquet of intense blackberry, cedar and graphite aromas that are quintessential Pauillac. Over a few minutes, it blossoms in the glass, gaining more and more depth. The palate is medium-bodied with slightly tarry black fruit, cedar and truffle, dovetailing into a saline, peppery finish that leaves the tongue tingling. Christian Seely and his team have imbued recent vintages of this Pauillac with unerring symmetry, and the 2016 can be added to the canon of triumphs. Drink 2023-2055. The 2016 Pichon-Longueville Baron is a blend of 85% Cabernet Sauvignon and 15% Merlot picked between 3 and 18 October at 39 hectoliters per hectare for estate (therefore the Grand Vin will be less). It is matured in 80% new oak and 20% one year old for 18 months. It has a very intense, extremely pure bouquet with blackberry, bilberry, cedar and graphite notes; it is a straight-down-the-fairway Pauillac. The palate is medium-bodied with a very tensile opening, that seam of graphite penetrating the black fruit. There is a wonderful structure here, unapologetically classic in style with just the right amount of austerity on the aristocratic finish. The aftertaste is incredibly long, lingering after two or three minutes in the mouth. This is a majestic Pichon-Baron and it may well to surpass both the 2009 or 2010. Drink 2026 - 2060. The 2016 Pichon Baron is seamless and racy from start to finish. Sensual and super-expressive, with soft contours, silky tannins and exceptional finesse, Pichon Baron is one of the more accessible wines in its peer group today. Plum, mocha, leather, spice and chocolate all build effortlessly. As outstanding as Pichon Baron is, the 2016 gives the impression it is playing things safe. It would be nice to see a little more daring and risk. Drink 2026 - 2041. The 2016 Pichon-Longueville Baron is fabulous. In fact, the 2016 is one of the best recent Pichon-Barons I can remember tasting. Smoke, gravel, chocolate, graphite, licorice, leather, black cherry and grilled herbs open up first as the wine shows off its extraordinary aromatic palette. Like so many wines in this vintage, the 2016 delivers serious flavor intensity, but with no excess weight. The richness of the Cabernet, at 85% of the blend, is palpable, as is the quality level. Vivid and deep to the core, the wine finishes with notable density, yet retains its midweight structure. This great 73 hectare vineyard has been producing top class Pauillac since the late 1980's when Jean-Michel Cazes of Lynch Bages took control and re-vitalised the property. In recent years, under the ownership of AXA insurance, Englishman Christian Seely has been in charge and quality continues to rise. The vineyard is planted with 62% Cabernet Sauvignon, 32% Merlot, 4% Cabernet Franc and 2% Petit Verdot. The grand vin is now made only from fruit produced in the original vineyard that is opposite Latour and next to Lascases. Latour-like in style, Pichon Baron has been a star performer in our recent blind vintage tastings. Two second labels are now produced - Les Griffons (from the younger vines) and Les Tourelles de Longueville (from a specific parcel of mostly Merlot vines). 85% Cabernet Sauvignon and 15% Merlot in 2016. A deep purple colour with a rich nose of cassis, marzipan, cedar and toast. The palate continues the fruit concentration and ripeness, but picks up restraint of graphite and tobacco to bring focus and savouriness to the balance. The tannins are chewy, powerful and Medocain - ripe but mouthcoating - and will give this wine superb longevity. In a string of high quality performances of late, the 2016 is another impressive effort here. This has some rich liquorice and gingerbread flavours, drawing deeply on the cassis fruits of the 85% Cabernet Sauvignon and 15% Merlot. This is incredibly dense and yet feels almost light across the palate. It doesn't have the upfront sexiness of the 2009, this is a more cerebral vintage. Neither does it have the architecture of the 2010, although the technical numbers are quite similar with high tannins and a pH of 3.6. It floats and builds up power slowly, with slightly chalky tannins on the finish. Less of a 'wall' than some recent years, an excellent wine. 45% of the estate's production from 73ha. To be aged in 80% new oak for 18 months.